Today, at GDC 2019 Oculus officially unveiled the latest iteration of its flagship PC-powered virtual reality headset, called Oculus Rift S, which is due to release later this spring priced at $399. The Rift S replaces the original Rift and features a number of new improvements that make the headset a slight step above its predecessor, however, the company has made it clear that the Rift S is considered more of an evolution of Rift rather than a revolution, hence why the company chose not to call the headset the ‘Rift 2’. At first glance, the design of the Rift S is completely revamped compared to the original. Oculus has partnered with Lenovo on the design and manufacturing of the headset, which now incorporates a new halo-style strap for increased comfort and better weight distribution. The re-design also improves on light blocking, as well as provides a simple, single-cable system solution for ease of use and clutter-free experience. Most notably, the Rift S uses the same inside-out ‘Insight’ tracking technology as on the standalone Oculus Quest. 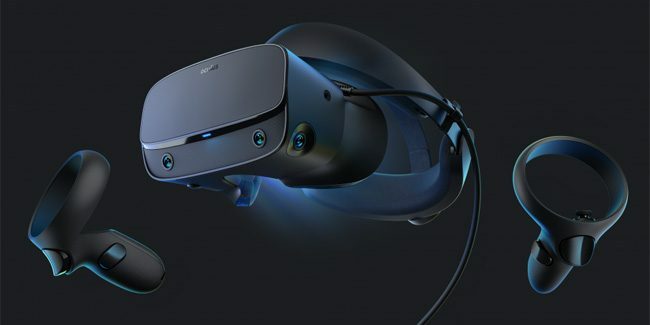 The Rift S headset features five built-in sensors—one more than Oculus Quest—which enables 6DoF (six degrees of freedom) inside-out tracking for full room-scale virtual reality experiences and removes the need to set up external sensors around the room as when using the original Rift. With the addition of a fifth ‘Insight’ sensor, it allows to maximize tracking volume and ensure that it remains compatible with all software existing in the Rift library. The Rift S display panel is a single fast-switch LCD with digital IPD adjust that delivers 1280×1440 per eye resolution (2560×1440 total), compared to the original Rift that uses duel ‘OLED’ panels for a total resolution of 2160×1200. While the single fast-switch LCD panel—same one used in the Oculus Go—brings the benefits of higher detail with a reduced “screen door effect”, it does, however, often means it lacks the color richness and deep blacks of OLED—but, considering the improvements made to LCD displays for VR over years it seems the trade-off will do for now. The refresh rate of the Rift S displays runs at 80Hz, which is slightly down from the original Rift’s OLED displays which run at 90hz. Oculus has stated that this was done to maintain the same PC hardware specification as the original Rift, ensuring that VR games run properly and help avoid fragmenting the existing user base. The lenses in the Rift S are new and improved and feature “next generation” lens technology that was first introduced in Go, offering better clarity and essentially eliminates the issue of “god rays” compared to the original Rift. There is also the addition of a new feature what Oculus calls Passthrough+, which enables users to see the surrounding real-world in black-and-white through the built-in cameras around the headset. With Passthrough+, users will be able to set up the Guardian system to map out their playspace much easier without even taking off their headset. The Oculus Rift S will launch alongside Oculus Quest this spring both at a price point of $399, and will each come bundled with the same pair of redesigned Oculus Touch controllers to work with the headset’s built-in cameras. As for the original Rift, Oculus says they are currently in the process of phasing out the headset and will replace it with the Rift S. We’ll be sure to keep you updated, as more details are released. Stay tuned!